As we age, we may worry if forgetting things is a normal or expected change, or if we might be declining. Researchers continue to study this topic. Our brain volume peaks in our 20’s, and begins to decline in the 40’s. These changes are due to the atrophy (shrinking) of nerve cells, and changes in the connections between the brain cells. Vague changes can be seen as we try to remember a person’s name, a date, and multi-tasking becomes more difficult. These changes are more evident as the blood flow to our brain also starts to become less efficient. Rather than a problem of storing new information, we become challenged with recalling information. However, researchers are demonstrating that with a little work, we can keep our brains functioning at full capacity, and that by simply THINKING we can do so (rather than doom-and-gloom or anxiety over declining), we can actually learn even more new things. The brain is really an amazing thing! Each part of the brain has its special function that works in harmony to help us move through our day. The frontal lobe gives us speech and the ability to find words and respond with emotion. It also gives us the capacity to plan, organize and execute. 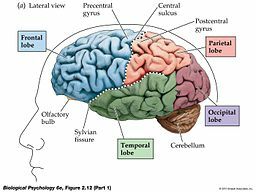 The parietal lobes help us with recognition, construction and movement. The temporal lobes store long-term memory and recognition of what we hear, see and feel (APA). The occipital lobe is responsible for processing of vision (Kinser, 2000). Psychologists note which types of changes in memory are more likely to occur. Memory challenges that we notice the most are about episodic events, such as ‘what did I eat for lunch?’, or ‘where did I park my car?’. Semantic memory (words, facts and concepts) and procedural (how to ride a bike) are the least affected by memory changes over time with aging. The factors that interfere with our memory is usually distractions that gets in the way of storing the information, and by interfering with our recall of that information later (APA). Researchers found that continuing to learn and challenging the brain can possibly prevent dementia while keeping the brain functioning at its optimum level. Learning a new language, or learning a new skill is one strategy. Some do puzzles or participate in games that involve strategy. In addition to challenging the brain, it’s also important to know that making lists is a perfectly normal and healthy way to remember things. It is also helpful to develop organizational skills and habits that promote brain health and memory. A healthy diet and getting exercise also promotes brain health by keeping the blood flow through the brain at its best. Reducing anxiety and distractions are important since this can be a barrier to learning and recalling information (APA). Return to the blog to see the next article, featuring the top 10 early warning signs of Alzheimer’s disease. Alzheimer’s Association (2016). 10 early signs and symptoms of Alzheimers. Retrieved from www.alz.org/10-signs-symptoms-alzheimers-dementia.asp on 4/23/17. American Psychological Association (nd). Memory changes in older adults. Retrieved from http://www.apa.org/research/action/memory-changes.aspx on 4/25/17. Kinser, P. (2000). Brain structures and their functions. Serendip Studio. Retrieved from http://serendip.brynmawr.edu/bb/kinser/Structure1.html on 4/25/17.